2D to 3D TV Converter, best 3D TV Converter, convert 2D DVD/AVI/MKV/M4V (iTunes)/WMV (Amazon) to 3D for 3D TV. Can you watch 2D movies in 3D on a 3D TV? Along with the increasingly well-being life, people are higher their requirement on living quality. 3D – a new vision experience, it has walk into our family. We spent money on buying high-quality 3D TV, at the same time, 3D can improve our life. I collected some favorite movies, I plan to watch them on 3D my TV, but they are 2D. How to watch 2D on TV in 3D? Can the TV convert 2D to 3D? Have no a TV can stream movie format so far. So, if you want to play 2D movies on TV in 3D, you have to convert 2D MKV/AVI/MOV/M4V/WMV to 3D for 3D TV via third-party software. There’re lots of converters for you to convert 2D video to 3D for 3D TV, the 2D to 3D TV Converter is a top choice if you’re looking for a fastest 2D to 3D TV converter. What the 2D to 3D TV Converter do for you? You can view the product page: TV Video Converter Ultimate. How to watch 2D movies on TV in 3D? Part One: Convert 2D to 3D via 3D TV Video Converter. Step 1: After run this fastest 2D to 3D converter, click “Add files” icon to import the 2D file into this software. Tip: 2D to 3D TV Converter supports batch conversion, and you may add multiple video files at a time. How to get 1080P 3D movies for TV? 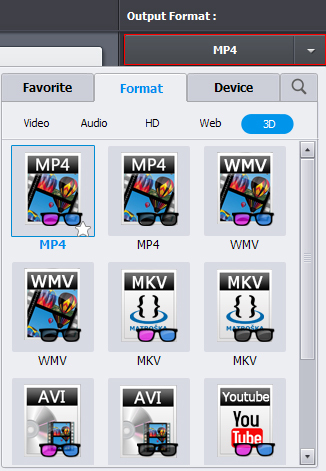 Click “Output Format”, you can choose “MP4” under “Format > 3D”. This is the best 3D format for your 3D TV. 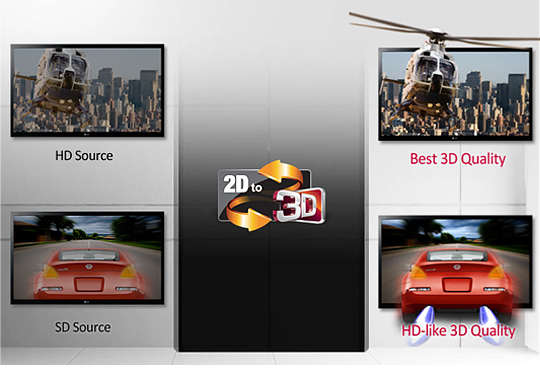 This step can help you get the best 3D movie and via best compatibility for TV. 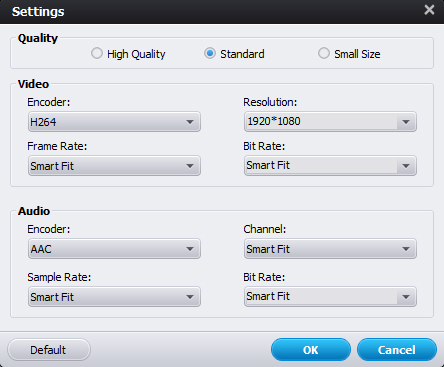 Click “Settings”, you need to select “H.264” as output video encoder, select 1920 *1080 as output video resolution, select “AAC” as output audio encoder. Please don’t forget click “Ok” button to save settings. Click “Convert” button to start 2D to 3D conversion. You will get 1080P 3D movie for 3D TV. Part Two: Play 2D movies on TV in 3D. After conversion, click “Open Folder”, then transfer the 1080P 3D movie to your USB Flash drive. How to play MTS video file on TV via USB?